This year at Heritage Hill we are introducing a far more extensive array of garden and deck decor to beautify your yard and outdoor living space. Donna has joined the team full time and has put in special attention to finding uniquely beautiful pieces that you simply will not find most anywhere! So for the month of April, we are introducing one of the new items and what a savings! 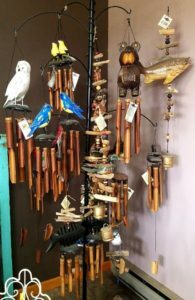 25% off on all of our wind chimes. Who doesn’t love sitting outdoors on those breezy late peaceful afternoons and enjoying the meditative, relaxing sound of chimes. Pictured to the right shows some of the beautiful Wind Chimes we are now stocking. Print the coupon and come in to take a look around! 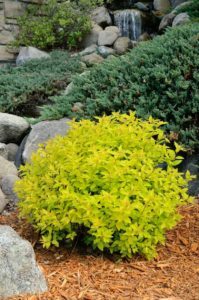 Additionally, our 2nd April offer is * 20% off of most varieties of Spirea. This plant is really easy to care for and will last for years. It’s perfect for walkway borders, adding a splash of color to landscaping in any number of locations. Spirea likes a lot of sun and it’s hardy too. Please be sure to stop in very soon to see what’s at the nursery!